It is almost certain that a new green wall installed in Kuwait is the emirate’s very first. 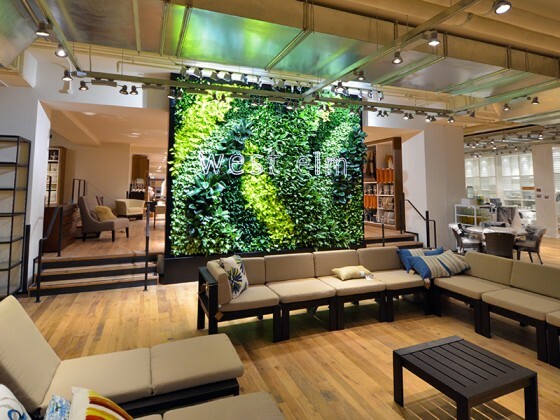 The 175 square foot vertical garden was installed in The Avenue Mall’s West Elm store to mark the first time the American furnishings company has opened an international branch. Featuring resilient plants as diverse as Dracaena, White Butterfly, and Ficus Elastica Robusta, the living wall livens up the space while also conveying to clientele the firm’s growing environmental commitment. GSky Plant Systems produces three different kinds of green wall systems, including the Versa Wall installed in Kuwait. Used as a branding element since West Elm received widespread acclaim for its first green wall in Seattle, it is completely self-sufficient, meaning that it requires virtually zero maintenance. And the plants won’t drink up a lot of water, which comes in short supply in Kuwait. The focal point of the store, the green wall is comprised of a series of 4″ potted plants, which mitigates fears about dripping water or other potential nuisance. A variety of species have been planted, promoting biodiversity and improving the 16,000 square foot retail store’s air quality. Plus it is said to complement West Elm’s commitment to selling only certified organic, recycled, non-toxic, rapidly renewable and responsibly produced home decor. 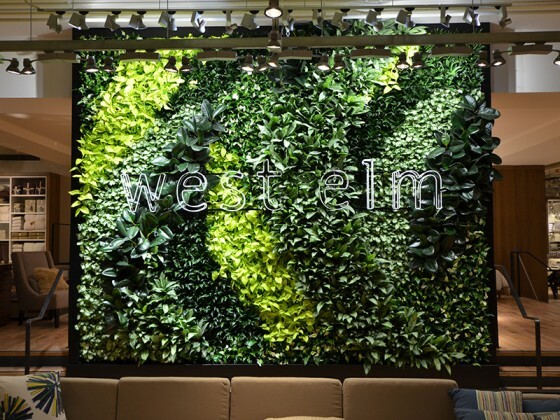 “The positive feedback that we have received from everybody with the green wall is an important factor of why it is part of our new store design concept for West Elm. It is attention grabbing and a major centerpiece for the store where people can stop to interact and admire the living artwork,” Patti Kashima, Director Store Design, Williams-Sonoma, Inc, said in a recent statement. 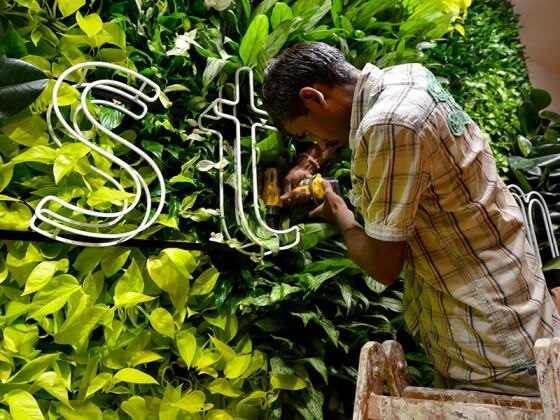 The uptake of living green walls, which are beautiful and make good business sense, has been slow in the Middle East. We’re hoping this one in Kuwait will catalyze a new trend. 360 mall in Kuwait has had a huge multistory green wall for many years now. They also have several small ones (though not as small as West Elm’s) throughout the building.